DeWALT cutter safety trainers are traditional steel toe cap trainers designed for comfort to protect your feet in hazardous environments. The mesh and leather upper ensures they remain lightweight, flexible and give you that casual style look. Anti-bacterial comfort inner sole, padded collar and tongue ensure these cutter safety trainers are comfortable to wear. The mesh allows air to get to your feet making them breathable so you can keep them on for longer periods of time making them more productive. Breathable mesh allows air to get to your feet, so you can keep them on for longer periods of time. 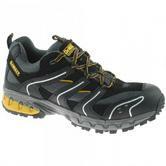 These DeWALT sports safety trainers are ideal for clean, light industrial use. Dewalt Cutter Safety Trainers conforms to: CE EN ISO 20345 - SB SRA Safety Rating. Smart knit fleece cardigan in melange coloured yarn with contrasting patches. 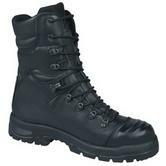 Excellent boot that is tough, durable and lightweight, this boot adapts to any terrain. Made from a Nu Buck water resistant upper. Safety protection is given via a lightweight steel toe cap & midsole. Padded ankle and tongue give added support around the foot. 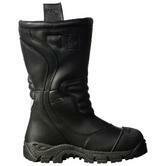 Orbit Midcut WB5 Black PU 900 Rubber Boot complies with EN 345-S3 safety standards. Magnum Pro Bunker Fireman Unisex Boots with Fire Retardant Leather. Sympatex® membrane which is fully Waterproof & Highly Breathable. Outlast® Adaptive Comfort Certified Space Technology regulates the temperature inside the boot for maximum wearer comfort. Toecap & Penetration Resistant Plate - Fully meets all safety footwear Requirements and provides excellent all-round protection. Otholite® footbed: to give long lasting comfort and support. Conform to: EN 15090:2006 Class 1/Type 2 F2IS CI SRA - EN 13287 SRA HI 3. These are often used by site visitors: they give the users' normal shoes an EN certified, 200J protective impact and compression resistant toe cap. The Millenium toe protect gives visitor a protective metal toe cap capable of withstanding impact of 200 Joules. Its a very practical design, the easy strap setup allows users to put them on and take them off very easily. Very reusable, designed to last a long time making them an economical choice. Available in a variety of different sizes, suitable for covering small , medium and large shoes. The materials used are tough and machine washable making these toe cap covers Hygienic. Conforms to EN ISO 20344 & EN ISO 12568 Safety Standards. Specifically designed for rough working environments this boot combines extreme durability with lightweight, comfort for all day. Extremely durable, breathable and abrasion resistant, water resistant leather Upper. Pre-formed, shock absorbing, breathable and abrasion resistant Foot-bed. Resistant to impact of 200 Joules Toe-Cap with wide fitting steel coated for corrosion resistance. Protective Midsole made from Flexible powder coated steel, resistant to 1,100 Newton. Anti-static, Heat resistant to 300°C PU rubber outsole. Dual Density PU/Rubber sole: exceptional abrasion resistance and ideal for environments where oils and solvents are used. Heat resistant to 300°C contact. 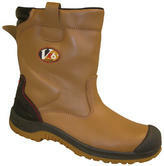 VTech E3570 Endura Safety Boots conform to: EN ISO 20345 S3 SRC safety standards. 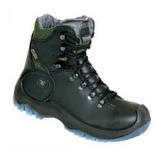 High S3 safety forestry shoe from Cofra. Made from Highly smooth, full-grain cowl leather. Oil resistant PU \ Nitrile sole, heat resistant outer sole up to 300C for 1 minute contact. Shock Absorbent heel, extremely rugged sole suitable for outdoor work. Full FELTEC, antistatic, anatomic Footbed, made of felt. Cofra Shield safety boots are equipped with Kevlar saw protection. Comparing to the size, it is extremely light chainsaw protective boots. Provided with steel Toe Cap, confirms to EN 345-1 S3 HRO safety standards. EN 381-3 Standard, Chainsaw protection class: 2 - Chain Speed 24 (meters per second). Water repellent full grain leather Upper, with internal metatarsal protection. Breathable synthetic External Lining and SANY-DRY internal Lining. Abrasion resistant, 100% polyester fabric SANY-DRY internal Lining is breathable, antibacterial and also absorbs and releases the moisture. EVANIT Footbed is made of EVA and nitrile special compound, variable thickness (12mm - 8mm - 3,8mm). Non metallic TOP RETURN safety Toe Cap resistant to 200 J. Non metallic APT PLATE - Zero Perforation Midsole protection. Stitched, fully made of nitrile rubber resistant to +300 C Sole (Resistant to +300C Heat for 1 minute contact). 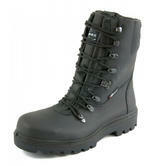 Cofra FRIBURG INTER-MET S3 SRC Safety Boots conforms to: EN ISO 20345:2011 S3 M HI CI HRO SRC safety standards. Gore-Tex, Membrane protects against bacteria and results high temperatures. Full piece footbed is made of felt, antistatic material, absorbs moisture. The PORON insert in the heel region absorbs the impact shock on the spinal column. Cofra guaranteed hygiene by the fabric lining which keep the foot dry absorbing and releasing moisture. FS20 is from the ever -popular Dr Martens ‘Air-Wair' range of safety footwear. It is a low- cut, 4 eyelet safety ankle boot. It has the classic DM yellow stitched welt, ‘Air Wair' sole. It has a padded collar for extra comfort and support. This boot has a steel toe cap for safety in the work place. The trademark Docs P.V.C. sole cushions your feet, as well as giving excellent slip resistant properties. 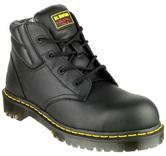 Dr Martens FS20Z Lace-Up Safety Boot conforms to: EN ISO20345 Safety Category SB. E+SRA safety standards. Lace boots with steel toe cap and with upper part made of full grain leather. Thinsulate & Ori-Tex membrane and a 3M Thinsulate lining to keep you warm and dry. TPU/PU sole with L protection including nail protection. Industrial work boot with high quality full grain leather upper. 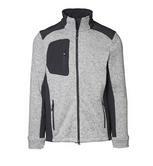 Padded collar and tongue for a firm fit and added comfort. Scuff Cap for extended protection and durability. Reinforced heel support, Steel Toe Cap Protection and Kevlar Midsole Plate. 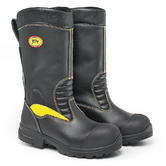 Wenaas 72-853 Forma Thunder safety boots conform to standards: EN ISO 20345, S3, WRU. A boot with a proven track record. This boot was designed for treeclimbing. Offering Chainsaw Class 2 protection and a supple mid and upper sole it combines both safety and comfort. Safety footwear with toecap resistant to an energy shock of 200 J and a pressure of 1500 daN. Besides that, reducing side-stitches as much as possible and using loops instead of hooks for the laces, to avoid friction and damage of your foot locking rope. Key features: - supple sole - knitted sole - no lace hooks = no rope damage. 1mm - 1,2mm thick leather lining, 1 mm thick velvet and high-tenacity textile. 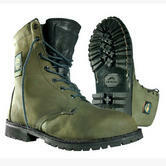 Safety boots material: 100% Nubuck hydrophobic leather 2,0mm – 2,2mm thick. SIP 3SA3 Chainsaw Portection Boot conforms to: EN ISO 20345-2004: SB+E+WRU+P+CI+HRO and EN ISO 17249:A1:2004 - class 2 safety standards. Amblers Steel FS220 W\P Safety. Amblers FS220 Safety Boot Conforms to EN ISO 20345:2011 safety standards. Impact and compression resistant toe cap. Anti-static and has an energy absorbing heel. This is made using the highest quality, premium, water resistant full grain leather with cordura textile. Light aluminium toe cap (50% lighter than steel). The outer layer of the sole is TPU with high physical and mechanical properties. The upper layer is soft expanded PU with resilient properties that emphasize the shock absorption capacity of the material. Heat resistance = 120 Deg C.
Gel insert penetrating the mid-sole in the heel, absorbs the impact shock deriving from the foot movement. GORE-TEX 4 layer GORE-TEX® membrane contains 1.4 billion of pores per square cm, big enough for moisture vapour to escape, but too small for wind, rain and snow to penetrate. GORE-TEX is therefore wind and water proof and simultaneously they have breathing capacity. Firefighter boots are made using full grain leather with water-repellent treatement - rubber toecap cover - rear gusset - innovative elastic system for perfect fit - rear pull-on loop - ankle protection. GORE-TEX® Lining - Performance Comfort Footwear, excellent for various climate conditions and for outdoor activities. Innovative laminate composite Insole made using antiperforation materials. Antistatic nitrile rubber Sole, heat and fuel oil resistant, non-slip, wear-resistant, shock absorbing heel. Extremely light aluminium Safety ToeCap resistant to 200 joules. 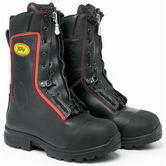 Jolly chain saw boot composed of cut resistant, light weight, ankle protection, high visiblity and heat insulation. GoreTex waterproof & breathable. Excellent for various climate conditions and for outdoor activities. Lightweight and agile, Metal-Free Forma Athlete Safety Trainers. The leather upper is made with a technical microfiber and cordura fabric. The shoe has non-metallic, soft nail protection and composite toe cap. Ideal safety trainer for working in industries where metal free footwear is needed. Wenaas Forma Athlete Metal-Free Safety Trainer complies to EN20345 S3 safety standards. 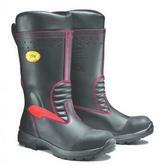 V12 Lynx Low Cut Metal Free Rigger S3 Safety Boot is made from a full grain supple cow hide water repellent upper. Composite toe cap and midsole offers excellent protection that is also lightweight. This boot is metal free making it very light on your feet, especially if its worn for long periods of time during the day. It includes durable pull on loops, pneumatic back for comfort when flexing or walking. Twin shock absorbing footbed is shaped to support and support the foot. Complies to EN ISO 20345:2011 S3 HRO SRC safety standards. Non-metallic toe cap resistant to 200 J and non-metallic midsole with Zero Perforation. Cofra Flint Non Metallic Boot footbed made of soft and scented polyurethane, anatomic and antistatic, holed, covered with cloth. There is a soft gel insert in the metatarsal area guarantees stability and comfort even on uneven surfaces. Made from abrasion resistant 100% polyamide fabric, breathable, it absorbs and releases the moisture. Cold protection thanks to thinsulate B200 lining. 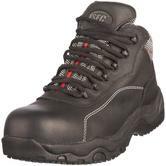 Cofra Flint Non Metallic Safety Boot complies to EN ISO 20345:2011 S3 CI HRO SRC. We have a wide range of discount workwear. These are branded items of workwear, which are all fully compliant, certified, desirable products. It just happens that we may not have a full size range left, so we offer them at discount as a last chance as long as they are available. When they are gone, they're gone. What we call Clearance workwear or low cost workwear is really the ends of lines of premium branded safety clothing, PPE and workwear. 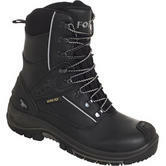 but you will get the best value, biggest discounted, premium branded safety boots in this category. Note the difference! eg We have a whopping 21% off the price of the V12 lace and zip Leopard safety boot; and we haev 28% off the Caterpillar Shelter - but only with limited sizes left. When its gone, its gone. If you are looking for the best value gloves, you will find plenty of discounted safety gloves on this page. eg The Ansell Hyflex 11-801 Glove with 29% price saving! We have over 1,000 lines of safety gloves - so rest assured: we have excellent value and some exceptionally low pricing for safety gloves. We have reusable gloves from about £0.40 (eg the Blackrock Barataec gripper glove) as well as many disposable gloves.